Problem 3 (10 points). Let x ∈ R. Prove that the following are equivalent. II) 3x + 2 is irrational. Цена 3 $ (180 руб). Если Вас устраивает цена уже ранее выполненной нами работы, Вы вносите оплату любым из способов, описанных на странице оплата. После чего через форму обратной связи сообщите сумму и время оплаты, а также ссылку на работу, за которую произвели оплату. После поступления денег и получения корректно заполненного комментария через форму обратной связи мы вышлем решение на Ваш e-mail. Problem 2 (10 points). Determine if each quantified statement is true or false. Цена 2 $ (120 руб). Question 1: (1 points): Let A=(1,2,3,4) and let R be this relation on A: R=((1,1), (1,2), (2,2), (3,3), (4,4)). True or false: R is irreflexive. Question 2: (1 points): Let R and S be relations on a. True or false: if R and S are reflexive, then R S is reflexive. Question 3: (1 points): Let R be the relation on the set of all people defined by (a,b) R if and only if a and b were born on the same day. True or false: R is reflexive. Question 4: (1 points): Let R be the relation on the real numbers defined as follows: R=((x,y)/x+y=0). True or false: R is asymmetric. Question 5: (1 points): Let R and S be relations on a set A. True or false: if R and S are asymmetric, then S R is asymmetric. Question 6: (1 points): Let R be the relation on the set of all people defined by (a,b) R if and only if a is a grandparent of b. True or false: R is reflexive. Question 7: (1 points): Let A=(1,2,3,4) and let R be this relation on A: R=((1,1), (2,2)). True or false: R is antisymmetric. 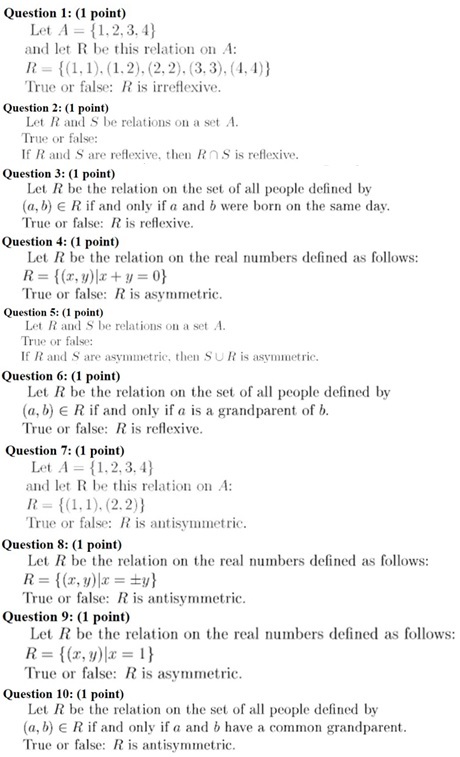 Question 8: Let R be the relation on the real numbers defined as follows: R=((x,y)/x=+-y). True or false: R is antisymmetric. Question 9: Let R be the relation on the real numbers defined as follows: R=((x,y)/x=1). True or false: R is asymmetric. Question 10: (1 points): Let R be the relation on the set of all people defined by (a,b) R if and only if a and b have a common grandparent. True or false: R is antisymmetric.